What does the HairPrime® system consist of? Who will benifit from the use of HairPrime®? For what percent of people is the HairPrime® Thinning Hair Program effective? What kind of results can I expect to see and how soon will I see them? How long has the HairPrime® Thinning Hair Program been available? The HairPrime® Thinning Hair Program is such an important breakthrough for thinning hair. Why haven't I heard of it before? Why is HairPrime® different from other natural hair products? What is the purpose of the HairPrime® Herbal & Vitamin Supplement? Can I use another hair loss product with HairPrime® Thinning Hair Program? Will I need to use these products for life? Is there anything I could be doing that inhibits the effects of HairPrime® Thinning Hair Program? I lost my hair many years ago, will HairPrime® Work for me? I typically wash my hair once a week; will this program still be useful? My hair feels oily when I use the HairPrime® Lotion, is this normal? Does the shampoo have an effect on the thinning hair condition? Can I use another Shampoo instead of HairPrime's? I am over thirty years old and I work full time. Lately, I have been under a lot of stress and I have noticed increasing thinning, what can I do? My doctor has me on all kinds of medications and I wonder if HairPrime® supplements will interfere with them? Are there any differences expected for women since the official results are based on experience with men? Why didn't the clinical trials include a larger sample of people and why has it not been tested on women? The HairPrime® system consists of: The herbal shampoo, herbal lotion, scalp primer and herbal supplements. These four natural products have been purposefully developed to work together to create what we consider to be an optimum environment for hair to grow. According to our clinical test results, 90% of the people that use the Hair Prime® thinning Hair Program will see results from the products. The results will vary according to the individual and their thinning hair condition. The people we tested are people with androgenetic alopecia, more commonly known as "male pattern baldness" which affects both men and women. Most individuals with actively thinning hair will notice an improvement in their thinning hair condition within 3-9 months of continuous, compliant use of the HairPrime® Program products. Results generally continue to improve over time. It is recommended that you use HairPrime® Program products for at least 12 months before deciding how well it works for you. After the second month of recommended use, the average person finding success using the HairPrime® Program products experiences a significant reduction of daily hair loss. After 3-4 months, the vellus "baby" hair that were falling out prematurely in 3-5 weeks should start to convert yielding somewhat longer and fuller hair. Most of the subjects in our controlled study experience a significant conversion of "baby" hair to terminal/mature hair within 40 weeks. You may experience satisfactory results in less time or it may take as long as 12-18 months. The HairPrime® Program was developed by Universal Biologics, a biotech, Cosmeceutical Company founded in 1989. The program has been available in California since 1990. In 1991 it was introduced to the national and international markets. 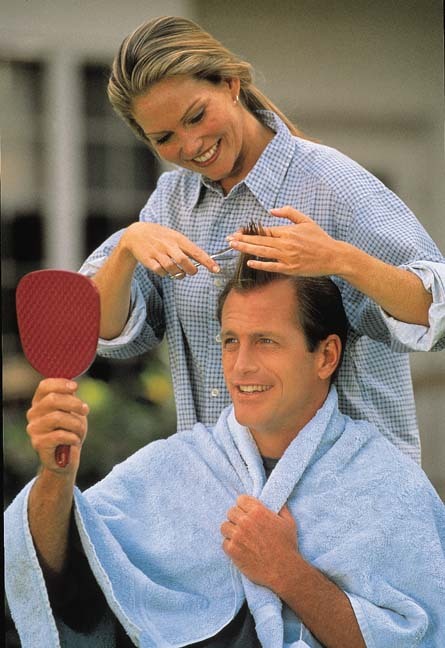 From 1990 to 1994 independent researches were conducted on the HairPrime® formula. In 1995 the U.S. Patent Office granted Universal Biologics a patent on the HairPrime® Cream and HairPrime® Herbal Shampoo. In 1998, the HairPrime® Program products were improved to include the HairPrime® Herbal Scalp Primer. Understanding the skepticism that many people have about thinning hair products, before going after the mass market, we have spent most of our time researching and testing the Hair Prime® Thinning Hair program to prove its effectiveness. Our marketing efforts have been limited to the direct sales through our 800 telephone number, the Internet, and a few exclusive catalogs such as SelfCare (a Northern California personal health care catalog). We have focused most of our marketing effort in ethical forums such as the American Academy of Dermatology (New Orleans 1995; Chicago, 1998; New Orleans, 1999), Hawaii Dermatology Seminar 1998), IBC Scientific Conference (Short Hills, NJ, 1999) and society of Chemists Annual Scientific Meeting (Chicago, 1999). It is our goal to reach the understanding and acceptance of the medical doctors and scientists to support our claims and efficiency so the public consumer may make a safer educated decision in whether to choose HairPrime® over the other drug alternatives or other treatments. We do not feel that mass market retailing would work unless and until the consumer is fully and competently informed as to the proper use of HairPrime® and the realistic expectations that may be achieved and gauged. The main difference is in how each one of us substantiate our claims. When a company makes outrageous claims about the benefits of its products, a lot of attention should be paid on the research they are based on. Important questions must be asked, such as, was the research conducted in the U.S. or in some other country? Was it performed by independent Dermatologists? How long did the research take? Was the clinical test performed on real people, in a scientifically accepted random sampling? Were the tests just performed in vitro (i.e. in a test tube)? Has it been presented to ethical medical forums for scrutiny or published in a major medical journal? Reputed Doctors and Dermatologists, who are still currently practicing in the U.S., conducted the HairPrime's clinical double-blind (random with control and placebo subjects) study in the U.S. The study, which lasted 48 weeks, was presented at the 1995 Annual Conference of the American Academy of Dermatology and then published in the prestigious Journal of Dermatological Treatment in October 1996. The supplement works from the inside to strengthen the body's internal capacity to support thicker, healthier hair naturally. It contains 3 vitamins & minerals and 17 herbs that we deem beneficial for healthy hair growth. When taking the supplements, people often notice an increase in energy and vitality. Some of the herbs have recently been identified in research as strong antioxidants, while others have been long recognized in herbal medicine to contribute to a healthy environment for hair to grow. We advise that you use only one thinning hair product at a time. As far as we know, no one has done testing on the effectiveness or the effects of using multiple hair products simultaneously. However it is possible that multiple product use can work in treating thinning hair condition, but it may become quite expensive. If you prefer, Rogaine® can be used to initiate the growth of hair and HairPrime® to nurture hair conversion. This approach may be logical but we suggest you consult your physician. Another thinning hair program that people like using is Propecia®. We see no reason, other than economic, why both Propecia® and HairPrime® cannot be used at the same time. Most definitely, Yes. More important to note, it is the only safe product for women to use that indicates "5 alpha reductase inhibition like" activity and a conversion of vellus "baby" hair to terminal/mature hair. Propecia® , with Finasteride® , indicates the same, but women are warned against its use or coming in contact with the drug, especially those of reproductive age. Minoxidil® has been formulated and packaged for women, but there is no report of an ability to convert the vellus "baby" hair and has proven to be marginally effective for men and only the 2% Minoxidil® solution is marketed to women. The new extra strength 5% Minoxidil® is packaged to be sold to men only. After achieving the desired results, you can cut back on your use to 1-2 times a week to maintain what you have achieved [some people have reported an effective maintenance use of only 1-2 times per month], of course if you stop using HairPrime® completely, nature will take its course. Factors including physical, physiological and chemical (e.g. synthetic ingredients) can reduce the results of HairPrime® Thinning Hair Program. These factors can directly effect how the product performs for you. Changes in hormonal activity such as menopause or pregnancy, medications including those related to hormone changes, medical ailments, the use of hair products with occlusive ingredients such as heavy synthetic conditioners, hair sprays, and also high levels of vitamin A. Increasing stress levels can also be harmful. If you think that one of these things could be affecting the product for you, consult customer support. Yes, men and women in all stages of thinning, regardless of your age or how long it has been since you first started thinning can use HairPrime® Thinning Hair Program. However, if you are completely bald on top, it may not be cost beneficial for example if you have 100 follicles with hair that convert and that number doubles, a 100% increase will still only be 200 hairs… statistically significant, but aesthetically still an appearance of baldness. The sooner you start treating your hair loss the better chance you have at saving what you have and helping those surviving hair follicles to convert vellus baby hair to terminal hair by extending the growth cycle. We recommend that people wash daily to keep the scalp clean and at least every other day to allow the active Herbal Lotion to be more effective. If you do not wash your hair at least every other day, we definitely recommend using HairPrime® scalp primer to remove the build-up of daily dirt and oils that creates residue while delivering a supplement of herbal extracts to support the herbal lotion. Yes, your hair may feel conditioned, oily or weighed down from using the HairPrime® Herbal Lotion (or Cream) depending on the condition (e.g. dry, oily, very thin hair, straight hair, frizzy hair etc.) However, many people apply too much. Remember, the lotion is applied on the scalp not the hair. The amount in each bottle of lotion is measured to last the person two months. Over-applying the product will not make the product work faster; you are only wasting the excess. If you don't like the way it makes your hair look, we advise applying the lotion/cream at night as directed and rinsing it off in the morning. Our shampoo is primarily a mild cleanser and will not irritate the scalp. It has a high concentration of herbal extracts and leaves the hair feeling fresh and clean. It is designed to cleanse and prepare the scalp to support the effectiveness of the Herbal Lotion. If you do not like our shampoo, we suggest you choose a shampoo that is similar to HairPrime's. Many shampoos have conditioners and occlusive ingredients that may diminish the effect of the Herbal Lotion. Some conditioners (e.g. -methicones) may make the hair look or feel silky, but they also block the effects of the Herbal Lotion. Therefore, we suggest that you use HairPrime® Shampoo to cleanse your scalp just before you apply the Herbal Lotion. On the day(s) you are not applying the Lotion, you may use a shampoo of your choice. However, if you notice that you loose more hair by using another shampoo, we recommend you desist and call our customer support. It is very common to experience thinning due to stress. Stress depletes the body of important nutrients that are needed to maintain health. We recommend using the HairPrime® Program for thinning hair. The HairPrime® Program is particularly effective because it is comprised of herbal products that create a healthy environment for hair growth. HairPrime® supplements are natural and gently effective in increasing vitality and an overall sense of well being. The HairPrime® supplements are not likely to interfere with any prescription medicines, but only a physician can be certain, based on one's health history and physiological reaction to the ingredients (e.g. some people have an adverse reaction to something as common as the mineral, Zinc.) So, when in doubt, either consult a physician or refrain from taking the supplements. The women who are currently using HairPrime® have written some of our strongest testimonials and have experienced more favorable results of all our customers. HairPrime® has been reported to be effective in treating Androgenetic Alopecia ("male pattern baldness") which affects women, too. The differences between men and women regarding Androgenetic Alopecia are the higher levels of 5 alpha reductase (the enzyme required to convert testosterone to DHT, the culprit behind the problem) and the quantitative differences in the two forms of the enzyme as well as the androgen receptors. Thus, accounting for the milder expression of hereditary hair thinning in women. First of all, there is no statistical significance in a larger sample, so long as the sample is adequate and the protocol is truly random and blind. A few women were tested in the pilot studies, but we were not successful in convincing women to participate in a study that required tattooing the scalp, periodically cutting the hair in that area at scalp level and staying with this routine for 40 weeks. Because of the economics and effort required to convince a statistically significant sample (at least 21) to participate in such a study, we have tabled our test on women for the future.